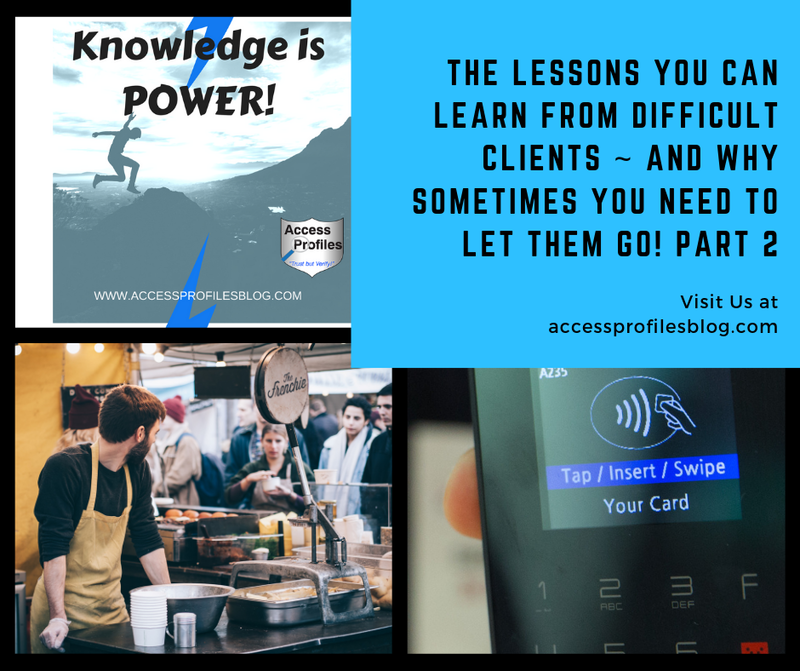 We have all encountered “difficult” clients. 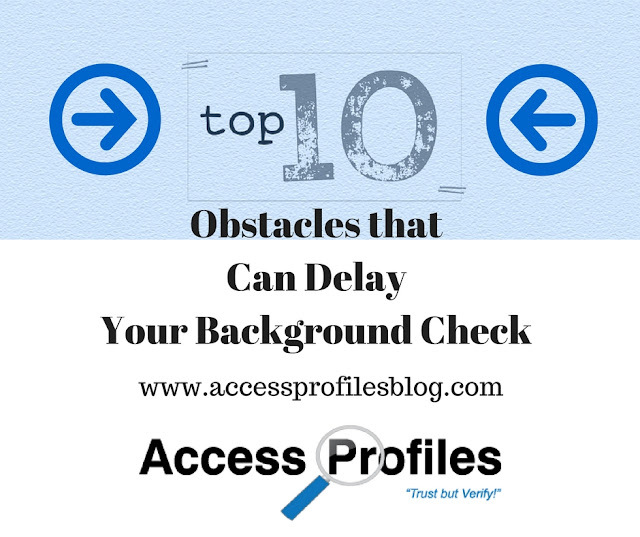 These clients are sometimes demanding, unreasonable, or even slow in paying. In some cases we can take what we learn from the situation and use it to forge a better working relationship, possibly keeping our client in the process. (Part 1 of this series focused on those lessons and how they can help you move forward, if you missed it you can read it here). But in other cases, continuing to work with that client that is simply not possible and even unwise. what can you do to make that break clean? How Does Your Client Treat You? If each time you communicate with your client they belittle you, your employees, or your work ~ then run. At no point do you or those around you deserve to be abused. Even if they are paying you, that is no excuse for unreasonable demands or a lack of respect. 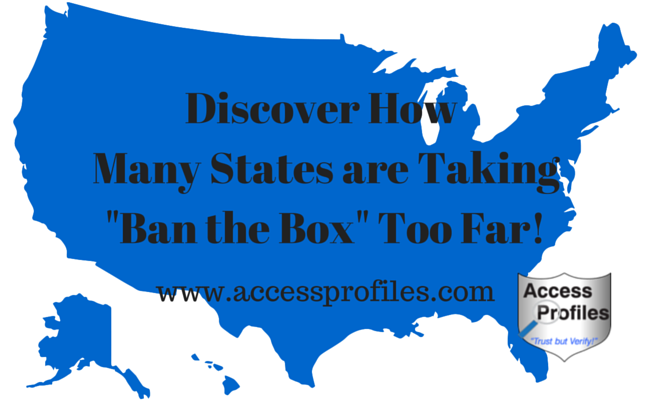 Is Your Client Taking up All of Your Time and Energy at the Expense of Other Clients? Any time one client is so demanding that you have nothing left to give, you are cheating your other clients. When you spend all your time answering their excessive phone calls or making countless changes, then you cannot give your other clients the time they deserve. How Does the Client Make You Feel? If you find yourself stressed at the the thought of working with them, then it is time to move on. If each time you even pick up the phone or sit down to send them an email, it makes your stomach churn, then let go. If even after giving them your best work, you are left questioning your abilities, then moving on is simply self-preservation. So the question then becomes...how do you make the break? It is best to keep it simple and direct. There is no need to rehash problems or even to burn bridges. Instead, first thank your client for the opportunity to work with them. Then simply say “however, at this time I am no longer able to provide you with our services”. Another option is, if your work with them is not on an ongoing basis, you can just wait until they contact you again and not opt to bid on the job. If asked why, just say that your workload does not allow you to take on another job. In either case, no long, drawn out explanation is needed. Once you make the break, it is time for a change. Now you can put new practices into place that will both lessen the chance of this happening again and help you move forward. 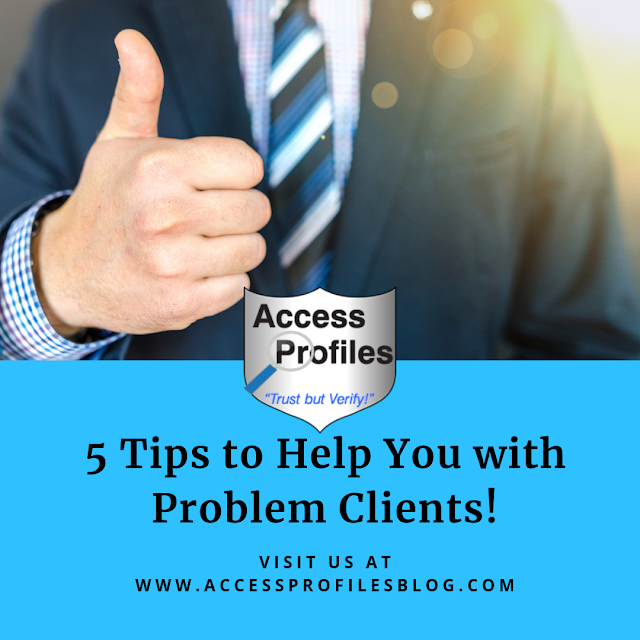 5 Tips to Help You with Problem Clients "Tweet This"
Send them thank you notes to let them know you appreciate their business. Offer them special deals for their loyalty. Anything you can think of to show you value them. For more tips on what you can do to make your clients feel appreciated, check out "What it Really Means to Have Good Customer Service"! It is important that you don’t let the bad customers ruin your morale. Nothing is worse than a depressed workplace, and you owe your customers and employees more than that. Join a local networking group or ramp up your social media, whatever helps you put your company in the spotlight and in front of potential customers. You will find that talking about your business and keeping your eye on the good you provide gives you a better mindset. Practice “recency” in your invoicing. Studies show that by sending your bill quickly, your invoice is thought to be more relevant. Another plus is that your client still has the great job you did, and your stellar service, fresh in their minds. Waiting days, or even weeks, to invoice is often increases the time it takes to get paid. 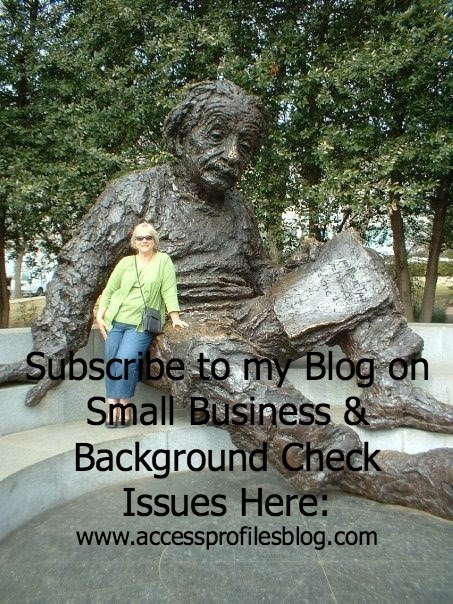 By using a background check to vet those you are thinking of doing business with, you can make a more informed decision. You may uncover a tendency for slow pay, a propensity to sue former business partners, or a host of other things that could give you pause. The idea here is to make sure there are no signs that should keep you from getting into a difficult business relationship in the first place! 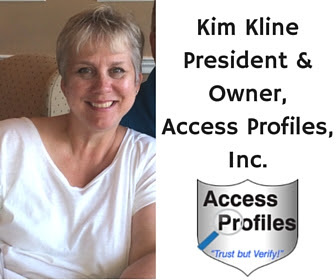 Discover more about how vetting potential clients, and employees, is good for your business in "Why You Need to 'Trust but Verify'!". We all enter business with the thought that we have something great to offer. We also believe that our clients are a large part of what it takes to make our business successful and our goal then becomes to do what it takes to make them happy. However, that does not mean that we need to stick with them no matter what. When that relationship becomes toxic, it is time to move on. And, in every business, we need to do what it takes to build a business we can be proud of without hurting ourselves along the way ~ and sometimes that means Letting Go! For more tips to help you with your small business, be sure to visit our site at www.accessprofilesblog.com. 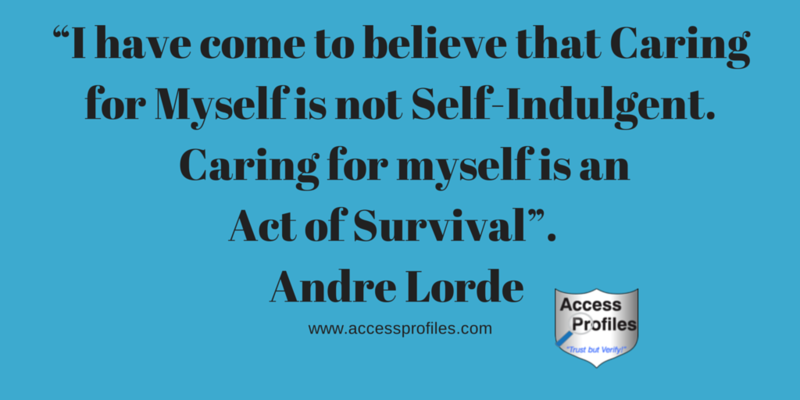 And Contact Us, API can help you hire more safely and effectively! We get a new client and set out to provide them with everything that we promised ~ and more. We get their work done on time, respond to all of their questions or concerns along the way, and provide the best service we possibly can. However, despite our best efforts, we soon find out they are the “client from hell”. Either their demands are through the roof or we find that they are extremely slow pay ~ or worse, no pay. No matter the circumstance, this is when you need to decide if it is worth keeping them as a client. While no business relishes the idea of losing a client or customer...Sometimes it is simply best to let them go! 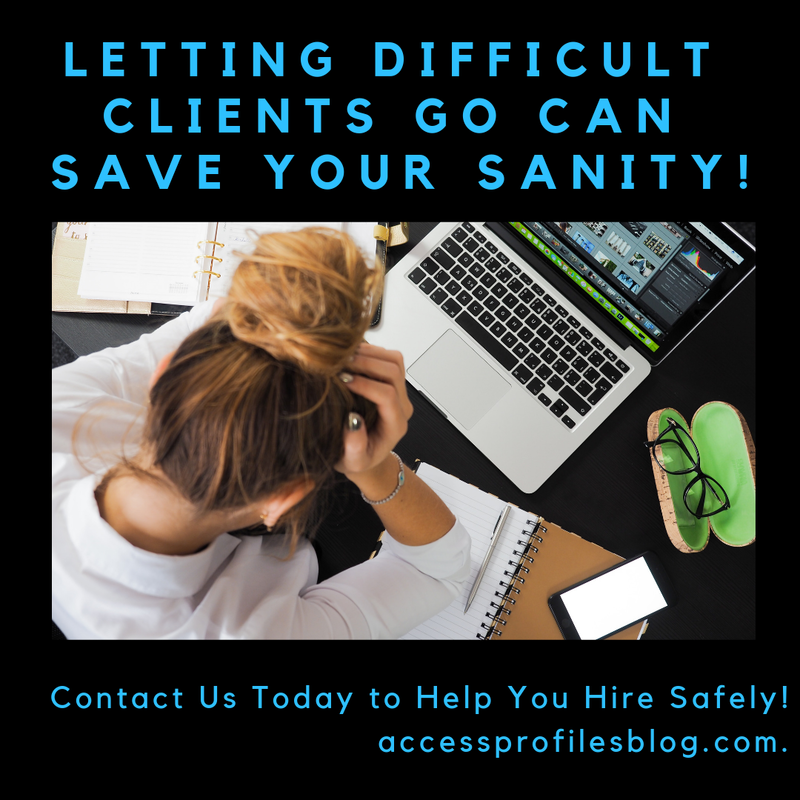 Letting Difficult Clients Go will Save Your Sanity! "Tweet This"
Letting Difficult Clients go is hard for many of us to concede. As business owners, we believe that our clients are the foundation of our businesses, and letting any of them go seems counterproductive. We pride ourselves on establishing good customer relationships and feel like a failure when they don't work out. There are times when we have to move away from that way of thinking. Instead, we need to recognize that moving on is really in our best interest ~ and the money we may be making just isn’t worth it. Sometimes it is possible to work with these clients and make things better, but other times it is not. The key is to know the difference. You will discover the Top 4 lessons you can actually learn from dealing with difficult clients! Once in a while we have run into a potential client who, from the outset, gave us pause. Sometimes we simply have a “gut instinct” that something isn’t quite right or from things they have said we can see we are not on the same page. During those times we have often found it is best to not commit to them at all. About a year ago we were approached by an online contact. 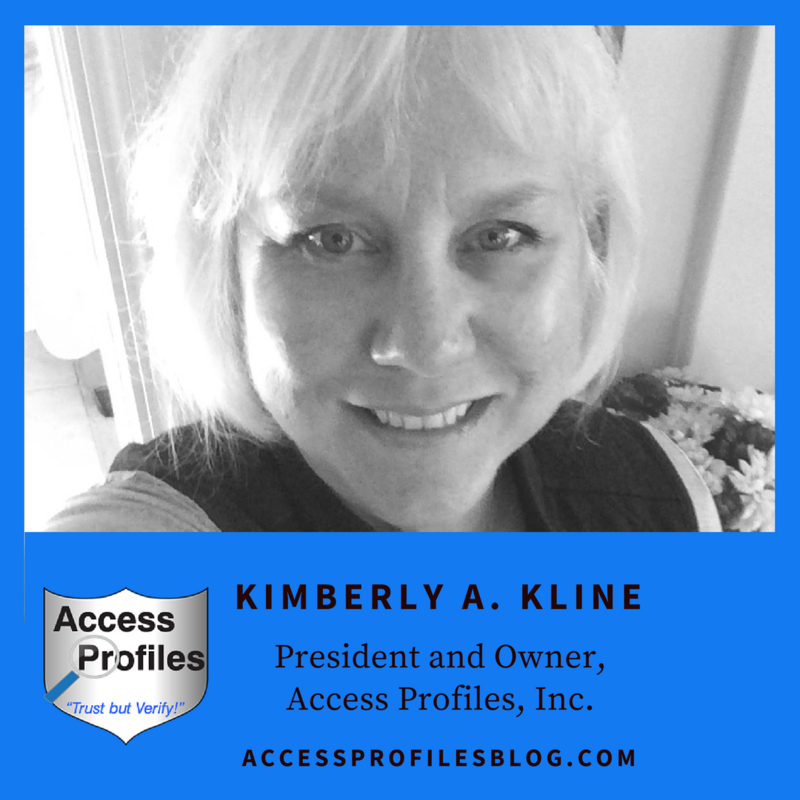 They were interested in using one of our newest services and we were excited by the prospect of getting that part of our business going. Our initial conversation went well. We explained exactly what API could do for them and at what cost. 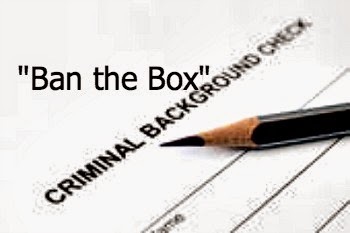 She explained she was eager to hire us immediately since they already had an applicant they wanted to screen. We sent her the release we use and asked her to let us know if she had any further questions before we began. That is when things went south. Shortly after sending the release, we received an email. In it she questioned having to provide a signed release at all. She also wanted what she called “immediate” results, the kind you can get from an “online court search”. We explained why it was not in her best interest to do business that way. 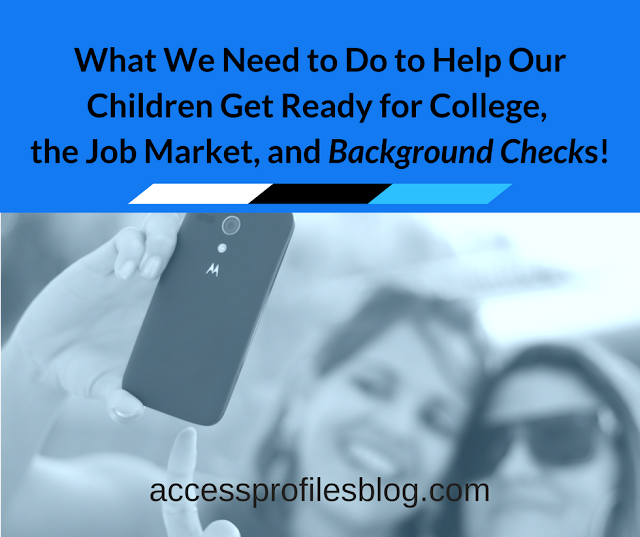 Her reaction prompted us to politely suggest she try another background check company. Your Takeaway ~ It is best to stop what is sure to be a bad business relationship in its tracks. Choosing not take on a client that shows no interest in following your advice or who wants to do business in a way that is not in line with your core values will save you a lot of headaches. Take a look at this situation ~ At the beginning of her business, Sandy Collier, owner of D'Zynnes by Sandy (a wedding planning service), ran into a difficult client. Collier was hired to plan her client’s wedding. From the outset, Collier found herself having to chase down her client again and again, whether it was to sign off on a design or simply to get paid for work completed. Then, according to Collier, the client lost her job. Now things went from bad to worse. All of a sudden phone calls were no longer being answered and payments were no longer made. Despite ultimately losing on this deal, Collier learned from it. She now uses contracts that spell out all her terms from the beginning. She also makes sure she gets the final payment 2 weeks before the event. 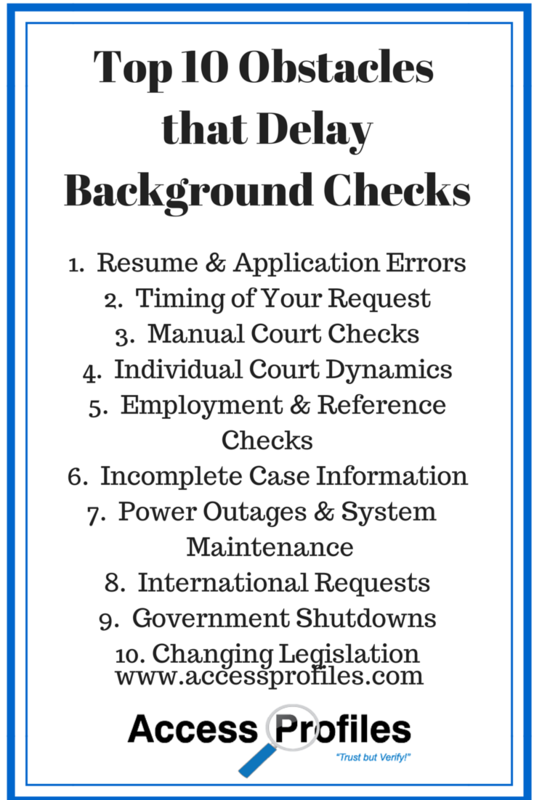 This has been key in assuring the check clears before she has no recourse. In reality, Collier’s bad experience helped her to never get caught like that again. Your Takeaway ~ Working with a contract, or at the very least making clear what services you will provide and your payment terms, is really in the best interest of both parties. For tips on what You should include in your contract, check out this article by Lee Crawford Law on “Why Should You Have a Written Contract?”. Marian Hayes Gravel, now an Industrial Designer/Usability Specialist, entered the world of small business making hairbands and scrunchies. Gravel made a deal to sell them on consignment to a local store. The problem was, even though inventory was being sold, the shop owner was not paying Gravel her cut and requests for payment were not yielding results. Unsure of what to do, Gravel contacted SCORE (Service Corps of Retired Executives). Her question to the advisor was "how do I take someone to small claims court so I can get paid?". Gravel says that this is when she got invaluable advice. Her advisor said that while he certainly could help her with that, he believed her best course of action was to maintain the relationship. He suggested that Gravel be pleasant but persistent in requesting her money from the store owner. And, according to Gravel, “it worked. I called her again and asked her (politely) for my money. She apologized and said she had a temporary cash-flow issue. And I got paid”. Gravel said “it was simple advice, but I remember it to this day”. Your Takeaway ~ It is possible to get the desired result by being Polite but Persistent. Many times just meeting with someone & being willing to work with them is the best course. Gravel’s experience mirrors one of our own. When Access Profiles first started, money was tight (as it is for many new small businesses). We felt fortunate to find one large client, and a few smaller ones, to work with. While thrilled to have this large client, the volume of work was at times overwhelming. However, we stuck it out and made sure that all jobs were done on time and completely accurately. Our process was to only bill upon completion of the work (which we still do to this day), with a 30 day payment period. In the span of 2 months, this larger company amassed quite a bill. The problem ~ they didn’t pay. We waited until a week after the 30 day grace period and called our contact. We were polite and explained that we had not received any payment and wondered if they needed us to resend their invoice. My contact promised to look into it and get back to me. We never heard from her, and our calls were no longer being answered. After many attempts to get paid, we even sent a registered letter formally requesting payment. In the end, the company filed for bankruptcy (in reality they simply merged with another company) and we never ended up getting paid for our work. Despite this bad experience, when we encountered a similar situation with one of our smaller clients, we once again attempted to proceed politely. However, this time the outcome was quite different. We were able to talk to them and discovered that they were not being paid by one of their clients. Because of this, money was tight. API worked with them and over time got paid in full. 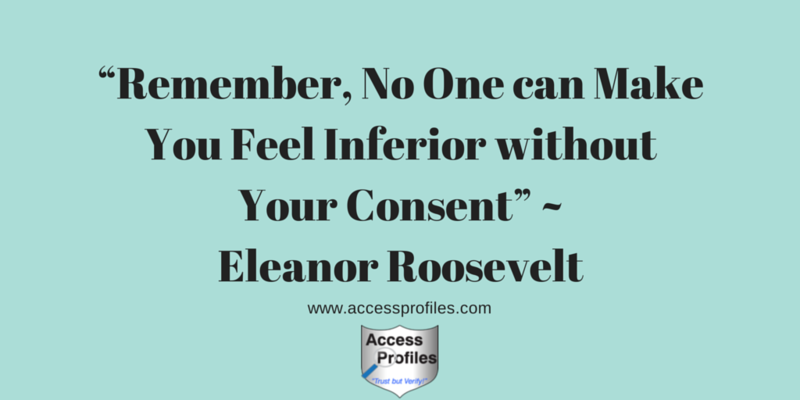 Our willingness to treat them with fairness has kept them as our client to this day! Your Takeaway ~ You need to look at what may seem like a difficult client on a case by case basis. There are times you can get past a rough spot and work things out, all while earning a loyal client in the process. the key is to learn from them. In the end, that is what makes a good entrepreneur! 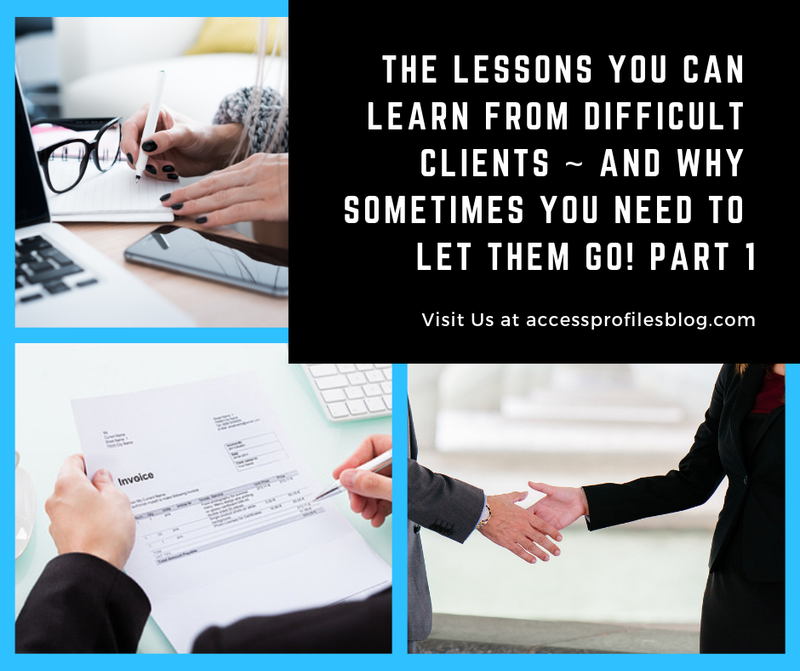 Be sure to check out Part 2 in this series on why, despite your best efforts, it is sometimes best to Let Difficult Clients Go!